Gyukatsu Motomura is one of those raved about places in Tokyo that’s a must-try if you’re in town. Worth the hype wait? Absolutely. The Shibuya location has the bigger shop front but if you’re like me and always running off to the next city, Gyukatsu Tokyo Station (Yaesu entrance) is the perfect traveler spot. In case you haven’t had gyukatsu before, it’s like the older brother of popular Japanese comfort food tonkatsu. Instead of a fried pork cutlet, you get a beef cutlet. A beautifully marbled beef cutlet. Hence the first thing you’ll do when you visit Gyukatsu Motomura is choose the size of your beef cutlet (100g, 130g, or 260g). Keep in mind your gyukatsu comes in a set with rice, miso soup, potato salad, tsukemono pickles, and shredded cabbage! Hidden passageway to Gyukatsu Motomura–if you exit out the Yaesu entrance, the shop is nestled in between office buildings so make sure not to miss it. The 130g gyukatsu+yam (とろろ) set! I loved putting the thickly grated yam sauce onto rice and mixing it up with some soy sauce. Gives you a super hearty feeling, reminds me of the feeling when warmed sukiyaki beef is dipped into egg! Each diner also gets a little grill alongside their gyukatsu set. This way you can warm your pieces of gyukatsu before dipping it into your sauce of choice. LOOK AT THAT M-A-R-B-LING!!!! Super tender pieces of beef that just melts in your mouth. I recommend trying a piece of it with soy sauce and just marveling at the consistency. Listening to pieces of gyukatsu sizzle as I eat was so satisfying. Try not to overcook it though! My friend Mizuha and I ordered the 130g Gyukatsu Set with Yam (tororo in Japanese) and were both very satisfied with the portion size. As you sit elbow-to-elbow other diners in the tiny L-shaped store, the simultaenous sound of gyukatsu sizzling on grills was Tokyo at its finest. Great food, small space, and light chatter doesn’t get better than this. Anyways, for those that have been asking me whether Gyukatsu Motomura is worthy of a visit in Tokyo, here’s my overdue review! Mmm it looks really good. Why I do enjoy my wagyu steak in its original form, your photos look so appetizing I must give gyukatsu a chance now. Agreed! 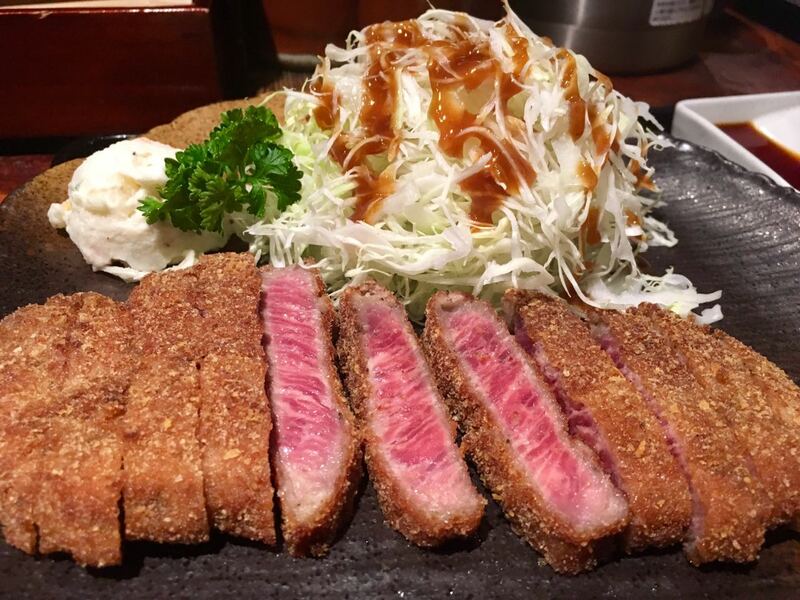 Definitely worth a try, you’ll be amazed at how the gyukatsu retains the lovely flavor of meat in its original form. Wish I was there now! We absolutely love Japanese food. Reblogged this on A Japan Life.